Cardiovascular doesn’t refer to just the heart; it also refers to the blood vessels. For the Physician Assistant Exam (known as PANCE), you have to worry about the arteries and veins as well as the heart. These practice questions are similar to the PANCE cardiology and vascular system questions. You’re evaluating a 78-year-old man who presents to the emergency room with a heart rate of about 140–150 beats per minute. On the monitor, you see a narrow-complex tachycardia, but it’s impossible to determine the underlying rhythm. You apply carotid massage, and the patient breaks into a normal sinus rhythm. What’s the likely original rhythm? 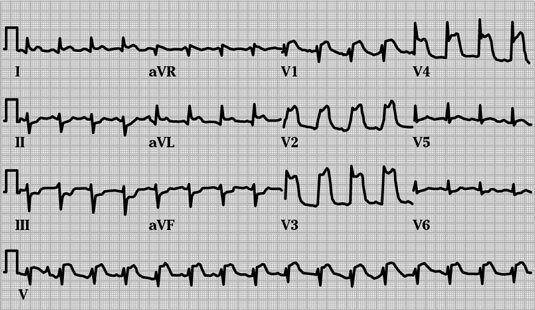 After reading this ECG, which one of the following would you do next? (B) Start aspirin, intravenous heparin, and nitroglycerin. (C) Take the patient emergently to the cardiac catheterization lab. (D) Give aspirin and a beta blocker. Then give IV heparin and nitroglycerin. (E) Start intravenous dobutamine (Dobutrex). You’re evaluating a 35-year-old man who presents to your office with a headache. On physical examination, his blood pressure is 240/120 mmHg. On fundoscopic examination, you note the presence of papilledema. What’s this person’s underlying diagnosis? Which class of medications would you recommend for a young man with a history of high blood pressure who also has significant anxiety and panic disorder? You’re evaluating a 25-year-old woman who presents with palpitations. On examination, you hear a midsystolic click. Which one of the following would you recommend concerning evaluation of her heart condition? (A) She should be screened for major depressive disorder. (B) She should be screened for a bleeding diathesis. (C) She should be screened for rheumatic fever. (D) Her murmur would decrease with a Valsalva maneuver. (E) She may need a beta blocker if the palpitations continue. Which one of the following would be used in the treatment of peripheral arterial disease (PAD)? Use this answer key to score the practice cardiovascular questions. The answer explanations give insight into why the correct answer is better than the other choices. 1. D. You can use carotid massage or Valsalva maneuvers to evaluate tachycardia. This intervention can either slow the rate down enough to identify the underlying rhythm or stop the rhythm in its path. Supraventricular tachycardia (SVT) — most commonly paroxysmal supraventricular tachycardia (PSVT) — breaks with a Valsalva maneuver or with adenosine. With Choices (A), (B), and (C) — atrial fibrillation, atrial flutter, and sinus tachycardia — these rhythms slow down, but they usually don’t break. For Choice (E), ventricular tachycardia, the initial treatment is lidocaine. 2. C. This person is having an acute STEMI (ST elevation myocardial infarction) involving the anterior wall. You can see the fireman’s hats on the ECG. This man needs to be taken to the cardiac catheterization lab pronto. Choice (E), dobutamine, isn’t applicable here because you have no indication that he’s in cardiogenic shock. Choices (A), (B), and (D) — starting indomethacin; starting aspirin, intravenous heparin, and nitroglycerin; and giving aspirin and a beta blocker followed by IV heparin and nitroglycerin — aren’t necessarily wrong, but none of them is the best answer. 3. A. This person has a headache and papilledema, which is a sign of damage due to hypertension. This is called hypertensive emergency. A blood pressure >= 180 mmHg systolic with no symptoms is an example of a hypertensive urgency, Choice (B). Recall that Stage I hypertension, Choice (C), is a systolic blood pressure of 140–159 mmHg and/or a diastolic blood pressure of 90–99 mmHg. With the new criteria from the Joint National Committee on Prevention, Detection, Evaluation, and Treatment of High Blood Pressure (JNC), there’s no Stage III hypertension, Choice (D), only Stages I and II. 4. B. In someone who has hypertension and panic disorder, beta blockers, Choice (B), are a good choice because the side effects include calming the person down. Alpha blockers, Choice (C), could be used in an older man with benign prostatic hyperplasia. ACE inhibitors, Choice (A), should be given first-line to anyone with hypertension, but you try to personalize your therapy as much as possible. Hydrochlorothiazide (Microzide), Choice (D), is used in the treatment of hypertension, as are calcium channel blockers, Choice (E). 5. E. This person has mitral valve prolapse, as seen with a midsystolic click. It’s associated with panic disorder, not depression, Choice (A). If palpitations occur with mitral valve prolapse, a beta blocker, Choice (E), first-line wouldn’t be unreasonable. Choice (B), bleeding diathesis, concerns the association between aortic stenosis and gastrointestinal bleeding secondary to arteriovenous malformation (AVM), which is termed acquired von Willebrand’s disease. Regarding Choice (C), you can see mitral stenosis and tricuspid stenosis with rheumatic fever. Mitral valve prolapse would increase in the setting of a Valsalva maneuver, Choice (D). 6. B. Choice (B), pentoxifylline, is an older medication used in treating peripheral arterial disease. Choice (A), indomethacin, is used to treat varicose veins and phlebitis by decreasing the inflammation. Choice (C), ranolazine, is an antianginal medication used in treating coronary artery disease for someone on maximal medical therapy; the ranolazine helps with symptoms. Choice (D), warfarin, is used in anticoagulation therapy for atrial fibrillation as well as for the treatment of a deep venous thrombosis. Choice (E), dabigatran, is a new medication used in treating atrial fibrillation.